There was a time when Disney wasn't a brand. Before Mickey. Before Snow White. Before Disneyland. Back then, it was just Walt. Young Walt Disney. Everything that Walt Disney became he credited to where he came from. 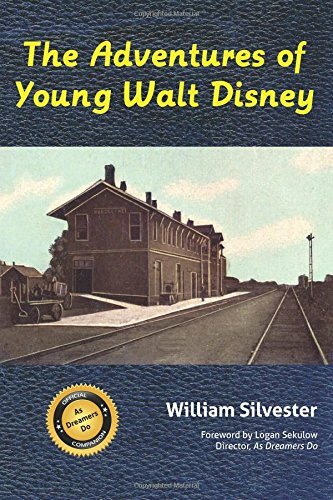 Historian William Silvester's sheds scholarly pretense and gives a fresh, readable account of Walt Disney growing up on the family farm in Marceline, driving for the Red Cross in France, and creating his first animations in Kansas City. Silvester takes you back to the early 1800s, when Walt's grandfather emigrated to New York from Ireland, and follows the Disney tale through Walt's escape from his failures in Kansas City to fairy-tale California, and fame. Walt's formative years in Marceline, his Huck Finn-ish exploits, and the small-town values that he brought with him to Main Street, U.S.A. The Adventures of Young Walt Disney is the official companion to Logan Sekulow's feature film, As Dreamers Do, available on demand through Amazon, Blockbuster, DirecTV, and elsewhere, and for purchase and Netflix, and for purchase at Wal-Mart, Best Buy, and other retail outlets. Put aside those Mickey ears. They haven't been invented yet. Come back to a simpler time, a time when America was changing so fast you had to dream just to keep up with it, a time when the biggest dreamer of them all was imagining the magical future he would soon create.